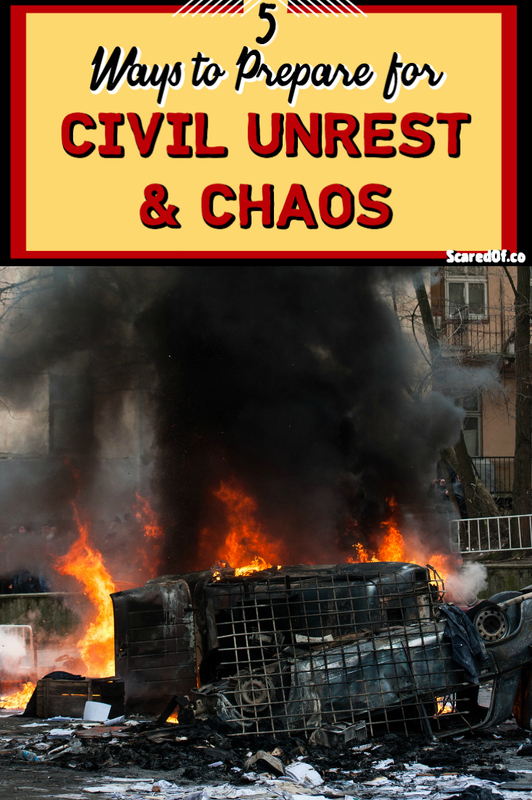 How to prepare for civil unrest. Civil unrest is not such a far fetched worry these days. If you live a big city, perhaps you’ve even seen it firsthand. Otherwise, just flip on the news, and it’s usually not hard to find a protest turned riot. It’s common for peaceful protests to take a chaotic turn. When you have large groups of people who are upset and passionate about a topic, it’s a recipe for chaos. Of course, the majority of people hold demonstrations with every intention of spreading their message in peace. However, with emotions running hot and the sprinkling of people who like to cause a stir, events erupt. You can’t decide who attends these protests. Unfortunately, some humans like to get in on any action and can ruin the overall meaning behind the gathering. When a protest takes a nasty turn, anarchy can erupt. A herd mentality takes over, and it becomes too much for local authorities to handle. Society norms go out the window, and it’s every man for himself. You can’t control how others behave but you can plan how to prepare for civil unrest should you find yourself in the middle of it. If the area you live or work in becomes an area of civil unrest, here are some things you can do to prepare. Have an escape plan. Figure out a way to distance yourself from the situation as quickly as possible. Think of ways through the town or city least likely to have roadblocks. If it’s your home you’re trying to leave, have a predetermined destination in mind well before something like this arises. Don’t get stuck. As much as you might want to protect your place of business, or stay in your work to ride it out, it might not be the best idea. Depending on how the situation escalates, businesses are targets. People loot and burn buildings during civil unrest. Fortify your place. If you are in a building considered relatively safe, reinforce it as much as possible. In this day and age, I think it’s wise for every business to amp up their security measures. Don’t wait until trouble happens. You are always better safe than sorry. And, yes, it can happen to you. Make your business the least attractive target, so the looters just move along quickly. Stock your car. Have a survival bag for each member of your family in your car. Pack necessary medications, baby supplies, and important papers in a bag where they are ready to grab if you need to leave in a hurry. Bring protection. If you need to flee, make sure you have food, water, and the necessary items to allow you to drive for a while. At the risk of sounding extra paranoid, you should also have some protection to defend yourself if need be. The goal is not to be a victim. As I type all of this, it sounds too extreme. Sadly, it’s really not. There’s no guarantee that the proper authorities can get it together quickly enough to gain control of an intense riot. There’s nothing wrong with being prepared to take care of yourself and your family. If you’re a bit on the paranoid side like I am, learn how to prepare for civil unrest to alleviate that fear a little bit.